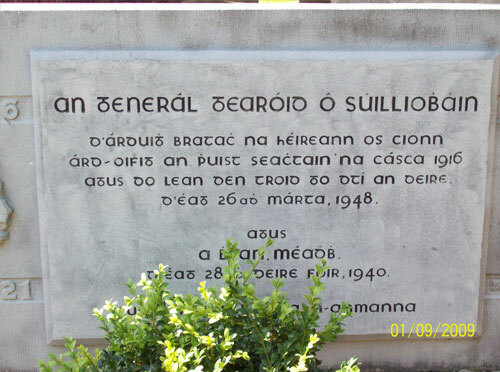 Gearóid O’Sullivan (28 January 1891 – 25 March 1948) was an Irish teacher, Irish language scholar, Prof of Languages, Army officer, barrister, Sinn Féin and Fine Gael politician. Born the fourth son of Michael and Margaret O’Sullivan in Coolnagurrane near Skibbereen in West Cork, he was given the name of Jeremiah, but known throughout his lifetime as Gearóid. His father, a native of Lough Ine, and his mother, née McCarthy, a Coolnagurrane native, were members of prominent West Cork farming families. Early into his education at the local national primary school, his intellectual capacity and promise of greater things was often remarked upon. Indeed, despite his young age, he was selected school monitor – a position of considerable responsibility, as the student monitors the progression of fellow students as well as the teaching capabilities of the teacher. He next studied at Daniel Duggan’s Intermediate and University School in Skibbereen; at about this time, he was to meet several individuals who would draw him further into the Irish nationalist movement and deepen his appreciation of Irish language and culture. These included James Duggan, a local Sinn Féin activist and acquaintance of Gearóid’s cousin Michael Collins. The two shared a grandmother on the McCarthy side of their respective families. Duggan encouraged Gearóid to join the Gaelic League, which he did at the mere age of 10. Notably, Gearóid’s father, Michael O’Sullivan, chose to complete the family’s 1911 Census form in Irish. O’Sullivan, then 25, had been personally chosen by Seán Mac Diarmada to serve as his aide-de-camp. James Connolly gave him the additional honor of raising the Tri-Colour over the GPO with an Irish Argentinian who hoisted the Green Flag of the Republic over the GPO at the same time. – He was Eamon Bulfin, born in Buenos Aires in 1892, the son of William Bulfin (1864-1910) from near Birr, Co. Offaly. His father William Bulfin had emigrated to Argentina at the age of 20 and was a writer and journalist who became editor and proprietor of ‘The Southern Cross’. A friend of Arthur Griffith, he did much to help launch Sinn Féin. William also helped finance Pádraig Pearse’s Scoil Éanna (St. Enda’s School) which opened in September, 1908).